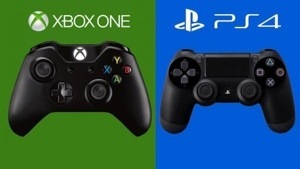 Which console will you be buying this November? In just a few short months we will leap into a whole new generation of console gaming. We’ll be experiencing new games with better graphics, new multiplayers with features that haven’t been possible until now, and a bucket load of exclusives that should keep the flame wars ignited for many years to come. If, like me, you can only afford one of these impressive beasts, which one is for you? There’s four important questions you need to ask yourself before you secure your preorder. If you like your online multiplayer then you’re going to want the same system as your friends. This might sound ridiculous to some people, why not buy the console you want? But with the emphasis developers are putting on multiplayer games for the next generation it makes perfect sense. Almost every launch title is very multiplayer heavy. If you popped Battlefield 4 into your PS4 on launch day only to find that all your friends were playing it on Xbox One, you’re gonna have a very lonely launch day indeed. If you’re not an online gamer you won’t have a problem. You will, however, be missing out. Probably the most important thing of all, the games. The exclusive games. The games that can only be found exclusively on Xbox One or PS4. This is where things start getting complicated. In my honest opinion, the launch title exclusives aren’t that great. On PS4 you’ve got Killzone: Shadow Fall, Knack and Drive Club. Xbox One has a slightly more impressive line up with Dead Rising 3, Killer Instinct, RYSE: Son Of Rome and Forza 5. These are all fine but it’s the exclusives that are set to be released some time within the launch window (between November and March) that have my attention. Xbox One has the incredible online FPS Titan Fall, but PS4 has the third instalment in the Infamous series, Infamous: Second Son. These are the only two real representations of next gen that I’ve seen so far. These are the only two games that have me genuinely excited. The problem is, they’re not on the same system. Microsoft and Sony both know how important exclusivity is on their next generation consoles, that’s why they’ve both boasted an impressive amount of exclusive within the first year. The Xbox One will have 15, 8 of which are brand new IPs (intellectual property), respectively . The PS4, however, has an astonishing 30 exclusives in development, 20 of which will be released in the first year, and 12 of them are brand new IPs. With all these exclusive games being announced as we get closer to launch day, it’s getting harder and harder to decide which console deserves a spot under my telly. A huge part of actually playing games is how we play them. We do this, of course, with the controller. It doesn’t seem like a big deal to some but to others, it’s a gateway to another world. It’s what allows us to interact with fictional characters, or avatars for people on the other side of the planet. If its done right, it melts away in your hand as you play and becomes a part of you. When you lose yourself in a game, you barely know it’s there. In a way, it’s what separates games from movies. So what have Microsoft and Sony done with the controllers this time? When first glancing at the Xbox One controller it would seem, not a great deal. Although Microsoft has assured us that over 40 changes have been made to their iconic pad. Perhaps the most interesting of said changes are the new impulse triggers. A small, vibrating motor in each trigger to allow the player to feel more subtle vibrations such as firing a gun or the rev of an engine. It’ll be interesting to see how developers use such an interesting new edition to the controller. Thankfully, Microsoft seem to have gone with the old “if it ain’t broke” approach to their controller, which a lot of people will be very happy about, seeing as the Xbox 360 controller is considered to be touching on perfection. Apart from, of course, the God-awful D-pad which is luckily one of the 40 changes to the Xbox One controller. The PS4 controller. The Duelshock 4. Successor to the Duelshock 3. I find myself torn when it comes to Sony’s controller. The sticks are better (finally concave), the triggers are better (finally actual triggers), and the body isn’t far off the size of a 360 controller. All of this is great but what about the touchscreen we know very little about? What about the gimmicky speaker in the middle? It’s a games machine, most gamers use headphones, why do we need a speaker? What about the huge, battery-sucking light-bar that’s rendered completely useless unless you fork out £80 for Sony’s equivalent to Kinect? All this has me very worried about the Duelshock 4. Hopefully they’ll release a refined version of the controller down the line without the light-bar, or at least a software update that’ll allow us to turn the damn light off! Either way, the Duelshock 4 is still shaping up to be a much needed improvement over the Duelshock 3. There are a few things to consider about the price of the consoles. 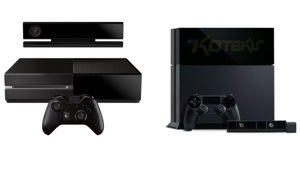 The Xbox One is £429 but all consoles come with Kinect. Lets say you’re going to want Xbox-live and a couple of games, you’re gonna be looking at spending £569 on day one! That’s a lot of money for a console. Want an extra controller? That’ll set you back another £50. Also, Microsoft will not bundle new headsets with the console. You’ll have to buy a new one for £20 or you can use you’re old 360 headset. The PS4 will cost a more affordable £349, although it doesn’t come with a camera like the Xbox One. This must be purchased separately. The PS4 does, however, come with a ‘hands-free’ style headset, which is one less thing to worry about. If you are planning on playing multiplayer on PS4 you’ll have to be a PS+ member. That’s right, you have to pay to play PS4 online. Don’t worry though, PS+ is a phenomenal deal giving you discounts, early access to demos and betas, and you even get 5 free games a month. It’s well worth the price of admission.